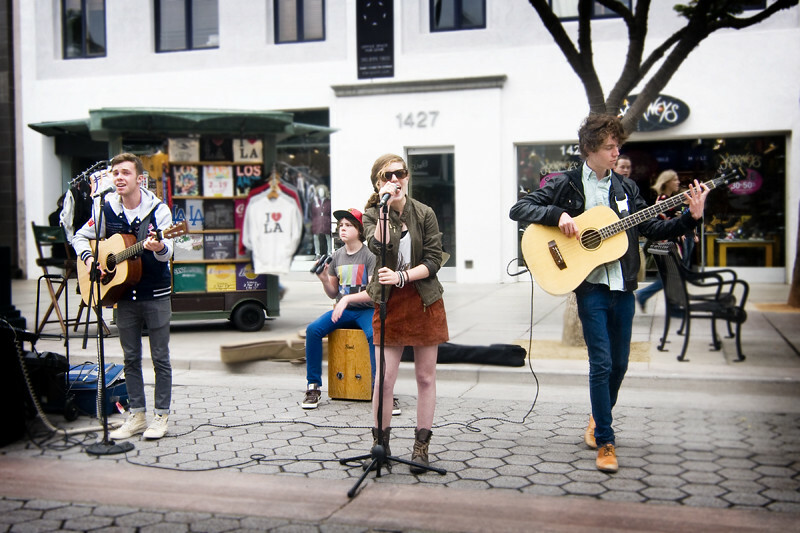 Echosmith (consisting of siblings Jamie, Graham, Sydney and Noah) performing on Santa Monica's 3rd St. Promenade. What a journey it has been for LA-based band Echosmith, the sibling quartet that got their start performing for spare change on busker row at the famous 3rd Street Promenade in Santa Monica. Weekend performances got them noticed by WB Records when they were originally called Ready Set Go. Today, their label, Warner Bros. Records, sent news confirming that Echosmith will be performing at Vans Warped Tour this summer. Playing on the Ernie Ball Stage, Echosmith is scheduled to show off their skills on the first half of the tour which travels across the U.S. from June 15th through July 12th. And according to the published dates, Echosmith will perform for their home crowd when the tour hits southern California June 20th and 21st at Pomona. Also, Echosmith will hit the road with Owl City next month for seven dates starting February 10th. Currently, the alt/pop quarted is in the midst of their January residency at AMPLIfy in Los Angeles. Be sure to check them out before they start selling out stadiums!! Echosmith, which consists of Sierota siblings Jamie (19, vocals/guitar), Sydney (15, vocals/keyboard), Noah (17, vocals/bass), and Graham (14, drums), are currently in the studio working on their upcoming debut album with producer Mike Elizondo (Tegan And Sara, No Doubt, Maroon 5), who signed them to Warner Bros. with WBR chairman and fellow producer Rob Cavallo.